Puerto Rico's Hilton employees participate in the annual event. Puerto Rico’s Hilton employees participate in the annual event. Caribe Hilton, The Condado Plaza Hilton, Embassy Suites San Juan Hotel & Casino y Embassy Suites by Hilton Dorado del Mar Beach Resort recently took part in Careers@Hilton Week, Hilton’s annual global career event showcasing the many opportunities available in the hospitality industry for youth and other job seekers. 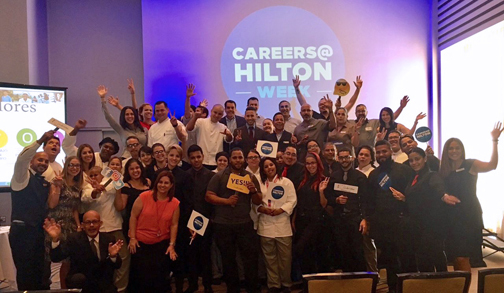 From May 15-21, Hilton hotels and corporate offices around the globe hosted hundreds of events to inform young people about “the exciting and diverse” career opportunities in the hospitality industry. This initiative is a part of Hilton’s Open Doors commitment, which aims to positively impact at least one million young people by 2019 by connecting them to opportunities in the hospitality industry, preparing them to reach their full potential or directly employing them, the company said. During that week, Caribe Hilton, The Condado Plaza Hilton, Embassy Suites San Juan Hotel and Casino and Embassy Suites by Hilton Dorado Beach Resort hosted several events in their facilities where they invited children from the following organizations and institutions, Professional Institute of Dorado and Alfonso López, School of Culinary Arts of the Universidad del Este, Institute of Banking and Commerce, and Independent Living Service of the Department of the Family. During their visit they enjoyed the facilities, talks related to the hotel industry and guidance on how to make a good job interview. “We will continue our commitment to the community in Puerto Rico especially with our children,” said Pablo Torres, general manager Caribe Hilton. Careers@Hilton Week events are a unique opportunity for Hilton to inspire job seekers about careers in the hospitality industry, and to support them by providing guidance on the skills that are vital to succeed in the workplace and beyond. Participants join Hilton for events ranging from résumé clinics to networking, as well as presentations from current employees about their career paths in hospitality. Hey Buddy!, I found this information for you: "PR Hilton hotels take part in annual global career event". Here is the website link: https://newsismybusiness.com/hotels-global-career/. Thank you.